Difficulty: Easy. There is a bit of challenge climbing over the log jam at the beginning of the hike. Proceed with caution. Water can be be deep depending on when you go. Terrain: Rocky river trail plus a small log jam that requires some climbing. 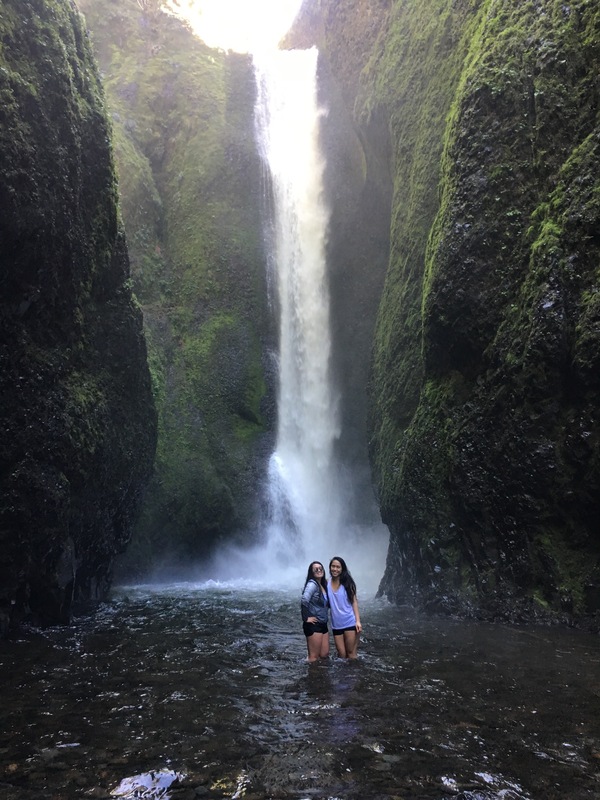 After experiencing the crowded gorge back in September 2015, we were ready to head back to Oneonta Gorge in hopes that the chillier waters will keep people away. Oneonta has become annoyingly popular in the last few years so we crossed our fingers and toes in hopes of a more secluded experience. 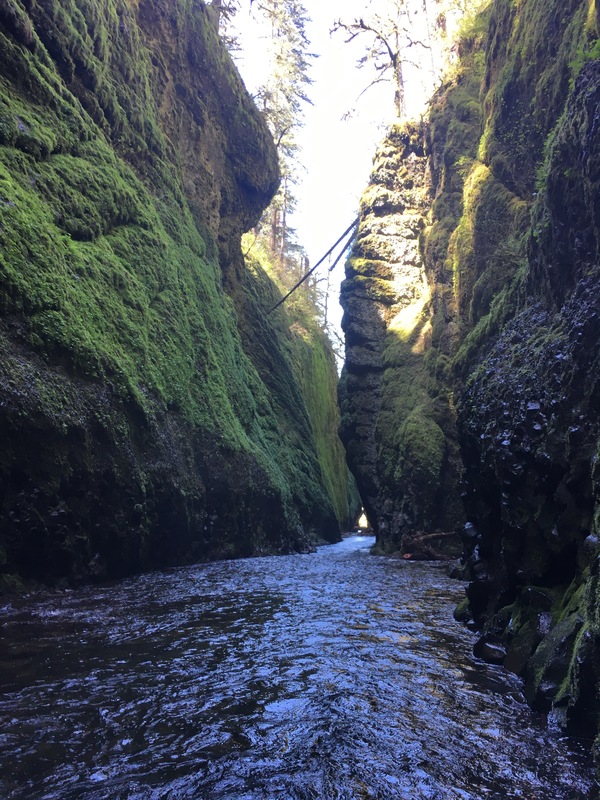 Located 2 miles east of Multnomah Falls, Oneonta Gorge should be easy to locate. There isn’t a designated parking lot for the hike but there should be decent roadside parking. Look out for the Oneonta Gorge sign and follow the stairs that will take you down the to the base of the gorge. From here, you’ll be hiking upstream the entire way. There were quite a few people at the beginning of the hike but most of them looked completely dry. We wondered if these hikers ended up turning back? Guess we’ll find out. The start of the trail had so much more water than the last time we were here. So be prepared to get wet during colder months! As we dipped our foot into the water, we felt a searing pain. It was a stinging sore-numbness that stung like nothing we’ve ever felt before. It caught us by surprise and it almost felt as our feet wanted to give up on us. HikeSnobs are no strangers to hiking through cold bodies of water but this was insane! Shivering and shaking, we continued moving forward at a steady pace before rushing to the next available fallen log to relieve our feet from the cold. The next few moments were filled with a lot of cursing and thoughts of turning back. The closer we got to the log jam, the less people we saw. Most people made it as far as the log jam before turning back. The water past the logs is significantly deeper. Be careful with your footing, Alice slipped and almost got submerged in the nasty water 😖 We saw three guys who went for it up ahead so we decided to just do it. Following the stream of the river, we hiked carefully to avoid all the deeper parts of the gorge. There are sections of the gorge on the left and right that provide as a temporary embankment. We weaved our way through and from the canyon walls. There is one section of the gorge that is extremely deep. If you’re not careful, you may be submerged in the freezing water. Luckily, we crossed paths with a Texan couple who were smart enough to bring their own personal inflatable raft. They kindly gave each of us a ride over the deepest part of the gorge. Without that raft you can expect to be chest deep in water if you are short like we are. With an empty and secluded waterfall in sight, we moved forward as quickly as our bodies would allow. It’s not so bad once you get used to it. The waterfall was much more powerful this time and we were completely alone! Was it worth the struggle and the numbness? YES! Questions? Comments? Suggestions? Leave us a message below! This looks like an awesome easy hike. 😱😱 The water level was already pretty deep two weeks ago. We hope everyone is okay! Yikes! That sounds scary. We’re glad they made it out. We wonder how long this hike will be closed for? Enter your email address to follow HikeSnobs and receive notifications of new posts by email.